Product prices and availability are accurate as of 2019-04-16 20:16:43 UTC and are subject to change. Any price and availability information displayed on http://www.amazon.com/ at the time of purchase will apply to the purchase of this product. With the innovative sit to stand electric adjusted desk, it's easy to achieve long lasting health benefits like burning more daily calories, boosting productivity, and improving posture. The electric motor allows for quick adjustment from sitting to standing, and four programmable memory buttons help you to save you preferred heights for easy recall. Perfect for desktop, laptop or tablet computing. Mobile and adjustable to meet your everyday needs. Included with the desk are both 1.5" heavy duty furniture casters (2 locking) and leveling, low-profile furniture feet allowing for customization based on your environment. The desk's work surface has a generous 47.25? wide x 29.5? deep surface. Everything needed for assembly is included. Maximum table load: 154 lbs. Overall dimension: 47.25?W x 29.5?D x 27.25" - 53" H (w/casters, 24.75" - 50.5" range with furniture feet). Model and props shown are not included. This product meets the minimum requirements of ANSI/BIFMA standards. Features an electric operated push button control that quickly adjusts from sitting to a standing desk in just 20 seconds (range from 29.5? 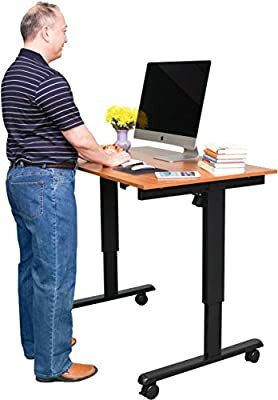 - 45.25?H) This innovative standing desk promotes better posture, reduced back and neck pain, a thinner waist line and increased productivity Moving the stand up desk from room to room is easy with the 3? furniture casters, and the desk locks into place with two locking brakes The large work surface design gives you plenty of work space and our adjustable height desk come in a variety of unique color options to fit your unique style or environment The frame is heavy duty steel ensuring years of use and the frame is finished with powder coat paint. This product meets the minimum requirements of ANSI/BIFMA standards.